Map of the world where you define an area then find out the estimated population inside that area. 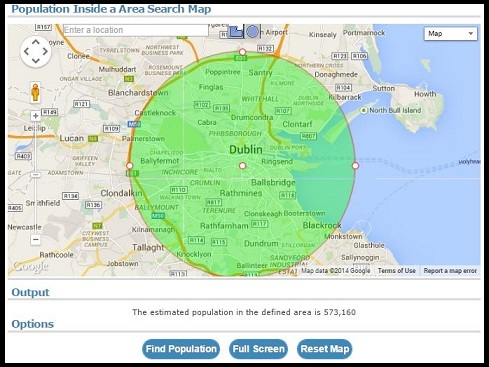 You can use this tool to find the population inside a radius of any location in the world or define a custom area and find the population in the area. Not accurate anymore. It used to be a great, reliable tool. Whatever changed caused population totals to be WAYYY low. The Full Screen button has been re-added. It puts the estimated population of Istanbul and the surrounding peninsula as 146,000. There are nearly 15 million people in Istanbul alone. Ace - it's back working again. Thank you for sorting it out. I can no longer get this application to work either. I'm not sure how accurate it was but it certainly gave me a rough figure in the past to be able work with. this is a very useful tool, however it does not work anymore. What's happened? This was such a useful tool. Now no longer works properly at all... What a shame. Thanks, got what I needed! I made a box that covered a large area, but it didn't work. Don't like the recent update. This is NOT accurate. I tried to use it to find the population of Hawaii and it told me 0. The population Radius only works sometimes....this is unreliable. This tool is very, very, very bad. That's an order! Not sure I should complain about something that is free, but the polygon tool is no nowhere near as functional as before the change. A shame, as this was a great tool I would have gladly paid a small fee for. Thanks for the update! I was hoping that this site would not get shutdown! getting for development purposes only? I have used it for 3 years and never had this issue! Please correct. Showing the most recent 20 out of 128 comments. Click to see all the comments.